The group Shinsei Kamattechan has become a formidable force to be dealt with in the Korean music scene its inception in 2007. Composed of members Noko (lead singer, guitar and keyboards, who also happens to be a shut-in), Mono (keyboards and guitar), Misako (Drums), and Chibagin (Bass), Shinsei grew a rabid fan-base by way of online videos and message boards as they are completely internet driven, including webcasting their live shows. Inspired by their story director Irie has crafted a fictional story set in the world of the band. The characters of Ringing in their Ears are comprised of a single mom and her son. The mom works two jobs, cleaner by day/exotic dancer by night, to support herself and her young son. Her son is an avid Shinsei Kamattechan fan, to the point where he is constantly getting in trouble for watching videos at school, and is constantly glued to his laptop at home, most nights having to put himself to sleep. We are also introduced to a female high school student who happens to be a top Shogi (a game similar to chess) player in the final stages of a tournament she is excelling in. She is turned on to Shinsei by her boyfriend, who dumps her for her best friend when she can’t go to the Shinsei concert which is the same night as her tournament finals, and immediately connects with them. Her brother himself has become a complete shut-in after teaching her how to play Shogi and she has started to lash out and pull away from her parents who are determined she go to university instead of becoming a ‘pro’ shogi player. We are also given a band related story as their manager is pressured to change the lyrics for a song to make it more marketable and his grappling with the decision to support the label or the band. The film builds as it goes towards the climatic live show which really delivers. All the performances for Shinsei Kamattechan are electric in the film and really deliver. Apparently they are even much better than their real live performances. 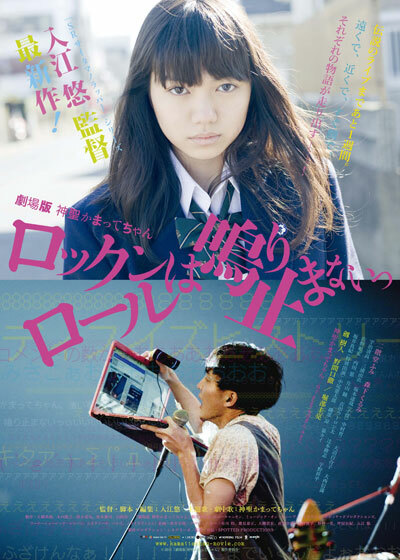 The Shogi playing High School girl (Nikaido) really is endearing and fascinating in a great performance. The child obsessed with Shinsei also performs admirably. The band comes off fairly well, but there isn’t a lot of their acting in the film which works well to hide their limitations. As I’ve stated the music really does soar on-screen and Director Irie really capture the frenetic essence of the band’s stage show well here. Ringing in their ears may be a very good introduction to the world of J-Pop and Japanese music for the uninitiated and still manages to tell a good story in the process. Ringing in their ears is a recommend.